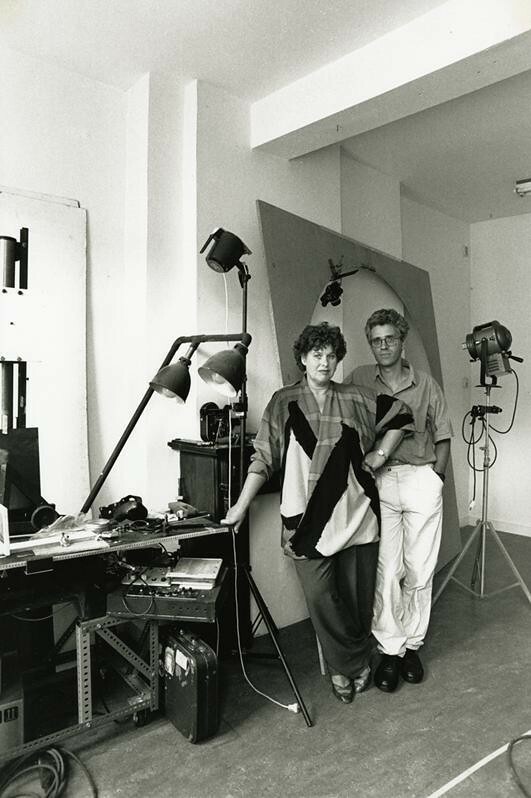 The filmmaker duo Jacques Verbeek and Karin Wiertz, active in the 1970s and 1980s, became known for their ingenious animated films. In addition to their films, EYE also manages their archive of notes, sketches, photographs, and artwork. These materials testify to their methodical working method, their endless patience, and their inventiveness and artistry. Karin Wiertz and Jacques Verbeek both studied at the Akademie voor Industriële Vormgeving in Eindhoven, and also at the more free-spirited Vrije Academie Psychopolis in The Hague. At both schools, they were students of filmmaker Frans Zwartjes, but as animators they were mostly self-taught. They acquired knowledge of animation techniques on their own, meaning that their working methods developed experimentally, often leading to unorthodox solutions. For Verbeek and Wiertz, each new film was a quest for new camera possibilities and new animation techniques. That is why none of their films is the same in terms of process or technique. In the fully analog-made, animated films of Verbeek and Wiertz, the story is secondary to the design. Most important is the choreography of abstract, figurative, and architectural elements. In Slippery Slope (1972) various elements from a room and from a landscape are interspersed. Artwork Slippery Slope. Animation cell coloured with paint and white foil. Artwork Keep on Turning (1972). Apart from the traditional square cells, Verbeek and Wiertz experimented with round cells, using a system based on the mechanics of an old turntable. At their home in Eindhoven or at special locations such as an old school, Verbeek and Wiertz often constructed their own sets and camera setups, using common household and gardening tools. For example, they used a haberdashery tape measure as the size indicator on their animation table. They only bought new photography or film equipment when their finances permitted it, for example when they won the Billiton-Van der Rijn Award in 1973. The archive of Verbeek and Wiertz contains many photographs printed on paper, which they used as studies for new films. For the actual filming, they often used series of sequential shots. In the film Between the Lights (1975) all pictures of the model, the décor pieces, and the female figure were first photographed and printed on photo paper. Color touches were then manually added with color pencils, and were shot frame-by-frame using the film camera. Artwork from Between the Lights: photograph coloured in with pencil. The perforation holes in the paper keep the photo exactly in the right place during the animation process. Artwork from Between the Lights. The duo also often worked with cell animation, which was the most prevalent animation method in those years. This technique used transparent sheets of plastic known as cells, which combined background drawings with painted motion phases. Verbeek and Wiertz also added photo cutouts and colored foils to those plastic cells. For the film Easy Action Animated (1978) a set was constructed consisting of a rotatable white cube whose walls could be disassembled. The choreography of the two actors was mathematically thought out in advance. For the filming, footprints were drawn on the floor. A single step consisted of eight phases. During the filming of the series of photographs, both actors had to stand still in a certain motion phase, hundreds of times over. The great amount of artwork testifies to how many calculations went into this way of working. Artwork from Easy Action Animated. There are no elaborate screenplays or storyboards in the archive. The ideas and concepts often emerged from a conceptual or visual fascination, and were recorded in the form of written notes, pencil sketches, or photographs. For example, a penchant for spiral staircases led to a search for existing locations in public space. But for the actual filming of The Case of the Spiral Staircase, they built a scale model and a decor piece featuring several steps built at full scale. Artwork from The Case of the Spiral Staircase. Pencil on paper. Photo of maquette for The Case of the Spiral Staircase. Detail of piled cells from The Case of the Spiral Staircase. Still from The Case of the Spiral Staircase. The film fragment below shows very clearly that the sketches, scale model and photographs are the essential building blocks for The Case of The Spiral Staircase. The fragment is from Beeld voor Beeld (1985), a documentary about Dutch animation film makers by Nico Crama. Courtesy of The Netherlands Institute for Sound and Vision. The division of tasks between the life partners Verbeek and Wiertz is hard to describe exactly, because they did a lot together. However, Verbeek was often the one behind the camera, and Wiertz in front of the camera. In all of their films that feature people, she acts as a model, usually with a wig and carefully selected clothes, so as to precisely maintain the same appearance during the often lengthy filming process. In the film There is a Garden in my Head (1987) in particular, various materials and animation techniques are combined. Using pixilation techniques, the model, on a self-made tapestry, is filmed directly under the film camera, frame by frame. At the same time, slides with floral motifs are projected onto the naked body, and animations are created using flowers made of fabric. The animations in the films were also edited together with snippets from photographs of pieces of fur, textiles, and artificial flowers. Artwork from There is a Garden in my Head: cutouts of photographs of artificial flowers. Artwork from There is a Garden in my Head: flowers made of textile. The working process of Verbeek and Wiertz is reflected in the diversity of materials in their archive. Just how special these filmmakers’ working process was can immediately be seen when the animated films are studied in conjunction with the many artworks, notes, sketches, and photographic material. With the passage of time, this material is showing more and more signs of decay; paper discoloration, crumbling paint, dried-out glue causing clippings to come loose, and plastic cells losing their flexibility and becoming distorted. Long-term preservation of these materials requires very specific storage conditions in controlled depots, and active conservation requires the knowledge of specialized restorers. Mette Peters is a film historian and animation specialist. She engages in conservation issues surrounding Dutch audiovisual heritage, through her publications and cooperations with archives and specialists. She researches the creative practice of animators in the Netherlands during the interwar period at Utrecht University and is a lecturer at the animation course of the Utrecht School of the Arts.